Reference number for this case: 23-Oct-54-Sundgau. Thank you for including this reference number in any correspondence with me regarding this case. Former journalist Christian Valentin published in 2004 and 2012 a quickly explained case in Alsace, reported in the regional Press. Late in the night of October 23, 1954, a frightened man was driving fast in his car on the Sundgau roads because he was chased for some short time by a luminous disc. Panicked, he stopped near a farm and woke up the residents. They welcomed him and reassured him in the end. Calmed down, the man resumed his night trip, accompanied by the shiny round shape of the Moon. Journalist Christian Valentin notes that some of the cases in Alsace in 1954 were quickly explained: on October 23, 1954, late in the night, a man in his car believed to be chased by a luminous disc. He was thrown into a panic, drove very quickly on the roads of the Sundgau, and ended up awaking the inhabitants of a farm. It then proved that the luminous disc was that of the moon, and the reassured man resumed his travel. In this book, also collected some cases in 1954 in Alsace that were quickly solved, such as this one, reported in L'Alsace for Saturday, October 16, 1954. This is one of many cases of misinterpretation caused by the moon while driving. It is almost a "negative" case as is gets identified soon. Mists, fogs, natural obstacles, and a "Red moon", are often factors preventing to recognize the Moon. The main factor is generally the illusion of being pursued: the Moon "stops" when the car stops, it "accelerates" when the car accelerates, it "veers" in the road turns. 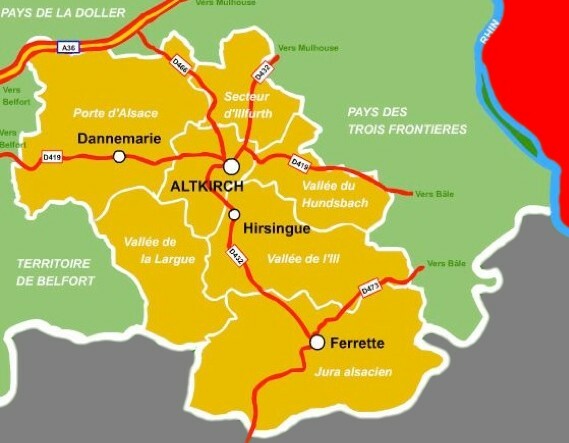 Above: In yellow, the region called The Sundgau, in the South of the Haut-Rhin in Alsace. Switzerland is in grey, Germany in red. Let's note that the Press source Note given in [cv2] must have a typo or error, since it is dated a few days before the events. Or maybe it is the date of the case that is erroneous. [---] In a regional newspaper, 1954. [cv1] "1954, l'Année des OVNIS - en Alsace et dans le Monde", dossier by Christian Valentin, in the quarterly magazine Saisons d'Alsace, Dernières Nouvelles d'Alsace publisher, France, #23, page 97, summer 2004. [cv2] "Mythes et Réalités des Phénomènes Aériens Non Identifiés - Histoire des soucoupes volantes en Alsace jusqu'en 1980", book by Christian Valentin, Grimoires d'Alsace publishers, France, page 65, 2012. 3.0 Patrick Gross March 4, 2016 Addition [cv2], Summary, Discussion.